← Download the latest issue of NYCentral Modeler! The 2Q2012 issue of Central Headlight is here! The 2nd Quarter (May) issue of Central Headlight has been mailed to all members on Monday, April 30. The lead article is a discussion of the major track relocation in Tonawanda and North Tonawanda, New York on NYC’s Niagara Branch, completed in 1922. The centerpiece of the relocation was a bascule bridge over Tonawanda Creek, and the cover depicts an Amtrak Empire Service train crossing the bridge in 1989. Other major features include a discussion of Central’s Flexi-Flow Program, and an article on New York Central’s barges, including a roster of nearly 400 NYC barges. NYCSHS members get the current issue mailed to them each quarter! Not a member? Join today! Not sure if you want to become a member? 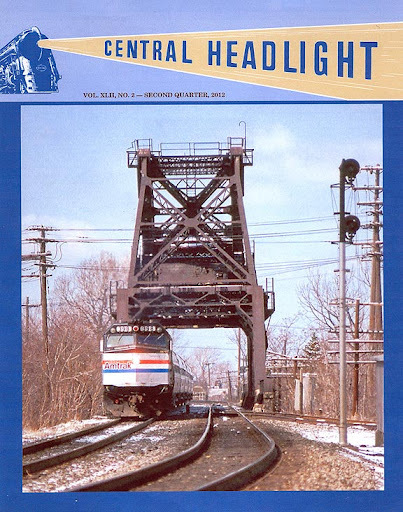 Members and non-members can purchase back issues of the Central Headlight here. This entry was posted in Central Headlight. Bookmark the permalink.